If you want to retire at 50, you have a few choices: start saving as much as you can as fast as you can; get lucky; or make something profitable (which also involves luck). On his website Early Retirement Extreme, Jacob describes how he achieved financial independence within five years by taking some extreme measures. He saved about 75% of his income by choosing a lifestyle that involved only spending money on the bare necessities. The bottom line is: if you're willing to do what few other people are for a few years (save a whopping 75% of what you make), you can achieve something that few others will (financial independence at a young age). In addition to saving a lot of money, there are a few other practical considerations to keep in mind if you want to retire at 50. For example, health insurance coverage can be quite costly before you reach Medicare age. Have you budgeted for this? And what you will do with your time? What if your desired hobbies will incur extra expenses? Some people have a retirement lifestyle that costs more, while others want to spend time at home cooking and gardening, which may reduce expenses. You also must realize you may live until 90, which means your savings and investments may need to cover forty years or more. To make sure your money lasts, you’ll need to avoid early retirement mistakes such as spending too much too soon, relying on unrealistic rates of return, or other factors not within your control. You can't count on a good stock market to make an early retirement work out for you. Some people are able to retire at 50 because they get lucky. Perhaps they win the lottery or receive a large inheritance. But even if you get lucky, you have to be smart and create a plan. Plenty of people come into money, and a few years later find they're broke again. If you do get lucky, create an investment plan to help you establish well-defined goals and objectives. You’ll also want to learn as much as possible about investing. You don’t have to become an expert, but if you gain an understanding of investing basics, you are less likely to fall for a scam. People with money are always targets for fraudsters. Be skeptical and educate yourself. But if you're serious about retiring at 50, don't count on luck. When was the last time you spotted a four-leaf clover? Either save as much as possible as fast as possible, or use your smarts to create intellectual property, as described below. Give something to the world that it needs. Try to invent something, grow and sell a business, or create intellectual property, such as a series of books, instruction manuals, or patents. Here success requires a combination of skill, smarts, business prowess, and luck, but it's a surer foundation for success. If you have a story to tell, an unusual or exceptional talent, or specialized knowledge in your field, look into ways to create regular revenue from this expertise or skill. If media celebrities can manufacture success out of an image, you'll have a better chance by establishing a real achievement with a product or service that people actually want. Check out the different types of intellectual property to give you an idea of what types of work you might be able to copyright, trademark, or patent. You can also brush up on ways to sell, market, and license various products you might create. Regardless of what approach you take, if you want to retire at 50, it's going to take discipline and a complete commitment to the goal. For some people, retiring means leaving their current employer, but it doesn't necessarily mean not working anymore. Maybe you want to retire because you're in a career that isn't a good fit or you have a boss you can't stand. A different career or new environment might completely change your perspective. Or perhaps you are entrepreneurial. 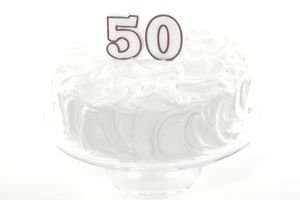 If you had your own business at 50, would that accomplish your goal? If what you really want is independence from a boss or employer, you might look into starting a consulting business or begin research on different small businesses you could start. This takes planning and time, and sometimes it requires capital to invest, but it may give you the independence you're seeking while still enabling you to earn income.